Hiring an expert to handle online classes may be the only option for busy professionals. Especially for military personnel located around the world. 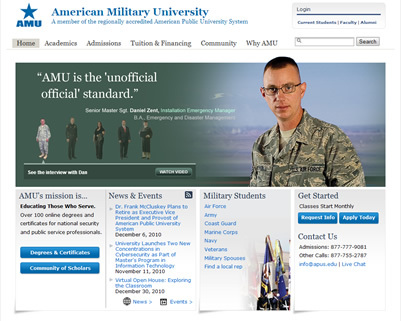 The AMU is an excellent option for the men and women of the armed services. But, the website of the online course as well as the manner in which the online course is delivered can be very confusing. You can hire an expert to work for you on your online class to get rid of the stress of the class. The expert will guarantee you a grade as well. For all math courses and a lot of courses connected with science, the grades are supported with a money back guarantee. The expert working on your AMU class will login to the American Military University website, complete any required assignments, quizzes or exams as well as discussion questions. They will update you on the progress of the class as needed. We are sure that you want to know exactly how much such services would cost. However, to give you the exact price quote for hiring an expert to take an online AMU class for you we need to have the basic information to access the course. As soon as we get the login information, we send our experts to take a look at the syllabus of the class. They will then determine the total amount of work required to finish the class. Some classes may require 4-6 hours of work per week while others may need as many as 15-20. In such situations, it becomes difficult to give uncertain figures for the cost of hiring an expert to complete a class offered by the American Military University. Once we get the required information i.e. the login/password as well as the exact web address of the class, we can give you a price quote for the project in as little as 24 hours. We will also give you a grade guarantee for the project. That will be the minimum grade your expert will achieve if you hire him/her. If you like the given price, you have the option of paying online and letting your hired expert get on with finishing your online AMU class. If not, then there is no obligation on your part. Start the process and your expert could be working on your American Military University class by tomorrow. We cannot give you price estimates or ball park figures for your online class without looking at its exact specifications. For online classes, please provide the login/password as well as the web address of the course so that we can give you the right price. Once we have that information we can determine the amount of work required to finish the class and use that to give you a price quote. Start by letting us know what the AMU class is about and we will find the right person that you can hire to finish all your online classes at the American Military University.